Reason #1 why its awesome to host the Air Force Academy. Brian just wasn't feeling it Saturday. I get it. I don't like it, but I get it. I hadn't felt a lack of possibilities since 1998, when Michigan was not going to repeat as national champions even before Donovan McNabb showed up. I went in at the usual time and sat in the usual spot and felt… not that. It turns out getting hammered 41-14 in your opening game restricts dreams of future glories quite a bit. It's like having New Year's Day on the eighth, a week after you found out you're not getting a promotion. You found this out because your boss stapled it to a bobcat he mailed to you. The stitches still itch. So when the band rolled out, it was weird. I did the thing with the clapping and the raising of the fist. The voice in the head that has been going ermagerd fortbaw ermagerddddd the last 13 years was not there. Alabama had taken it, ripped its pigtails out, stomped on it, and returned it to me. They said "what?" confrontationally. They asked if I was going to do anything about it. I said "no, sir." It sat in the corner, petting itself, maybe whispering ermagerd fortbaw, maybe not. It was hard to make out. Yes, it's true...Michigan ended the day with 422 yards of total offense. Denard ended the day with 426. We're not going to DEFCON 2 just yet. It's a nod to Robinson's singular talent, but also to the lack of production from others. Namely, the tailbacks. Fitz Toussaint returned from his one-game suspension, but his game didn't. He finished with eight carries for 7 yards, an even worse output than what backups Vincent Smith and Thomas Rawls posted against Alabama without him. After two games, Michigan's tailbacks combine for 49 yards on 27 carries -- a meager 1.8 yards per carry. I expect Denard to get a few touches against UMass, but nowhere near his AF output. But also expect the "non-Denard rushing game" to get back on track. The UMass game is all about gaining confidence. The Huskers will be okay this year, as they should be ranked when the Badgers visit on September 29th for their Adidas North vs West bowl. If this team is 4-2 heading into the bye week, most if not all will accept that, me included. Less than that, and oh dear get the bomb shelters ready. I take back all those awesome things I said about Nebraska in the off-season. Two games. Wisconsin's new OL coach lasted two games. I mean, yeah, they played bad. But fired after two games?! I see your Markuson and raise you two years of GERG. The problems reached a breaking point in the 10-7 loss at Oregon State on Saturday, with issues in the running game and also in pass protection. The Badgers finished with 23 rushing attempts for 35 net yards, which included three sacks of quarterback Danny O’Brien for 35 yards in losses. I take back all those awesome things I said about Wisconsin in the off-season. The Big Ten didn't wait until New Year's Day to endure its national flogging. The league assumed the position in Week 2. By now, these lines pretty much write themselves, right? 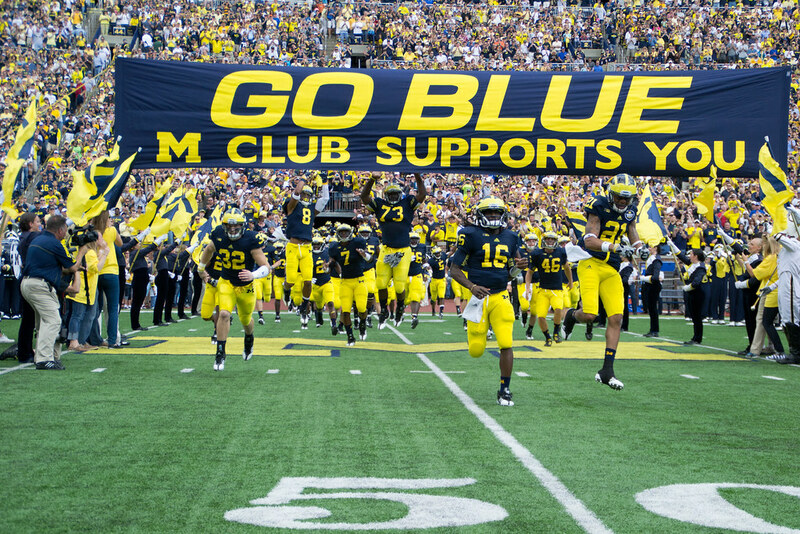 When I was down on the field for pregame, I snapped a few pics of the new M Club banner. The maize really popped out to me. I bet it has that new banner smell. 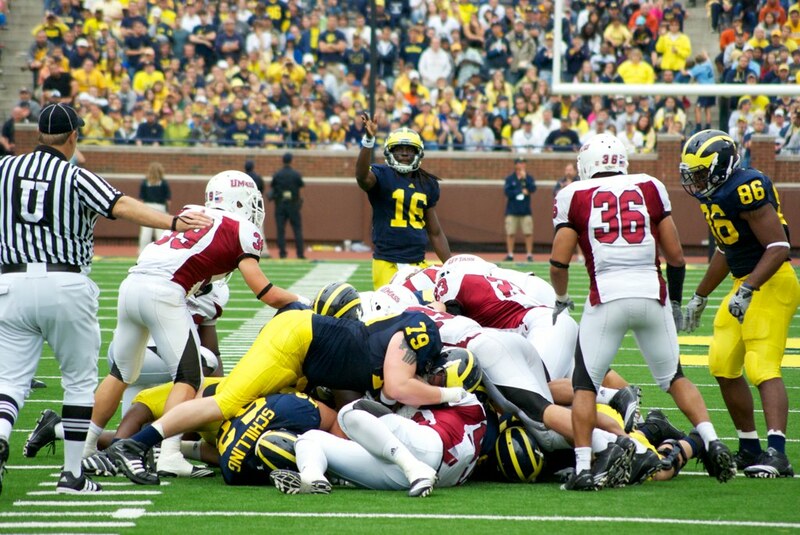 Michigan is favored by 45 1/2 points this week against UMass. That's the biggest spread in school history. Shutdown fullback recaps week 2. Brady Hoke talked to the media today. Maize n Brew breaks down 5 key plays from the AF game. Brendan Beyer will miss the UMass game. He should be back in a "couple weeks". This video reminds me why I am so very glad to not be an Arkansas fan right now. EDSBS's Spencer Hall reminds Arkansas fans to "step away from the internet".